This animation demonstrates our NanaWall SL60 floor supported system roller option. To deal with building movement, the NanaWall floor supported option offers stainless steel wheels on a stainless steel track for continual smooth operation, even with up to 3/8” of debris in the track. Choose from various configuration options that include a daily access door without needing to open the entire system. The NanaWall SL60 meets the German “DIN EN 1191/12400 Classification” where a unit is tested after 20,000 opening and closing cycles and is still functional. 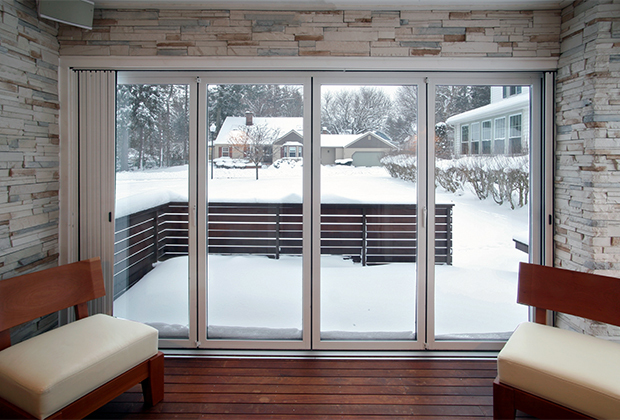 The NanaWall SL60 features a concealed locking rod and locks into both the head track and sill. The locking hardware has passed forced entry testing. The NanaWall SL60 has been tested for sound control and has a remarkable resistance to wind driven rain.